Linkody automates the whole process. Know when you lose or gain links. Get insights in competitors' linkbuilding strategies. Analyse your link profile with tons of metrics. Easily identify and disavow bad links. Start monitoring your valuable backlinks today! And gain advantage over your competitors. Why use Linkody's Backlink Tracker? Even though the landscape of SEO is ever evolving, getting and keeping valuable backlinks remains important. But how do you assess which backlinks are valuable? What if your hard earned links are removed without you knowing it? And how are your competitors using backlinks to get more SEO traffic? Linkody helps you answer these (and more) questions! Several users under a same Linkody account. Easily find "bad" backlinks and disavow them. Visually locate the link on the source page in just one click. Check your landing pages meta-data and optimize for keywords. See which links point to them. Receive daily detailed link reports in your inbox. Moz Rank, Domain Authority, Page Authority, Spam Score. With your logo, ready to be sent to your clients. Facebook shares & likes, LinkedIn, Google Plus. 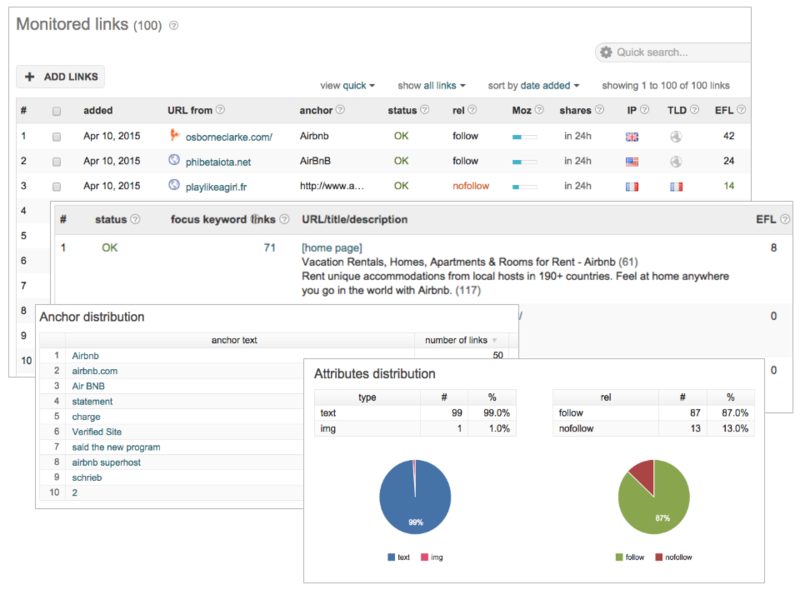 Connect your Google Analytics account to Linkody to get more backlink data. Download unlimited rows of metrics with a single click. Redirections, follow/nofollow, outgoing links, anchor text, Alexa rank, etc. Reliable backlink monitoring tool, great service, happy customers! Join the hundreds of happy customers who are relying on Linkody’s easy-to-use backlink tracker and great customer support. Linkody is the Rolls of backlink monitoring! Without doubt, Linkody is the best backlink software on the market today. With this tool we can easily adjust our SEO strategy. Besides, the support is great! 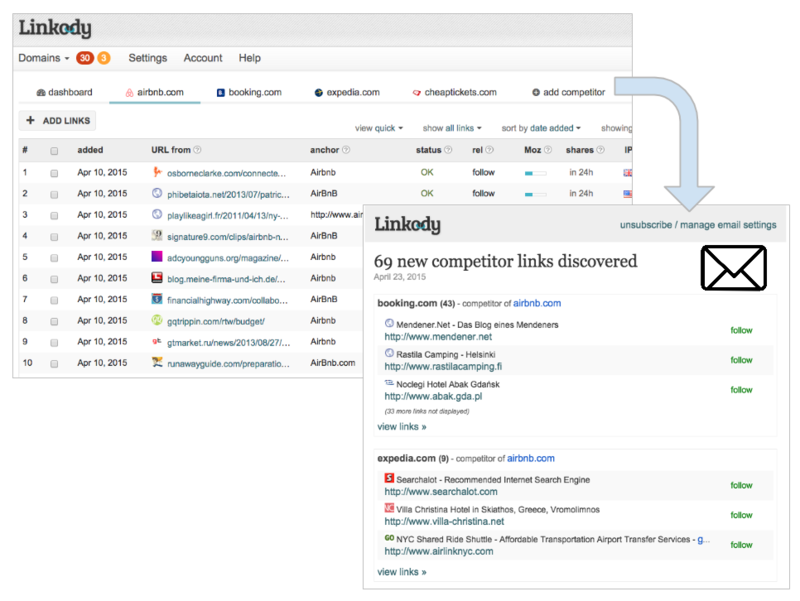 See up to 100 referring domains instantly with Linkody’s Free Backlink Checker. You can use this tool to check 2 unique domains per week. 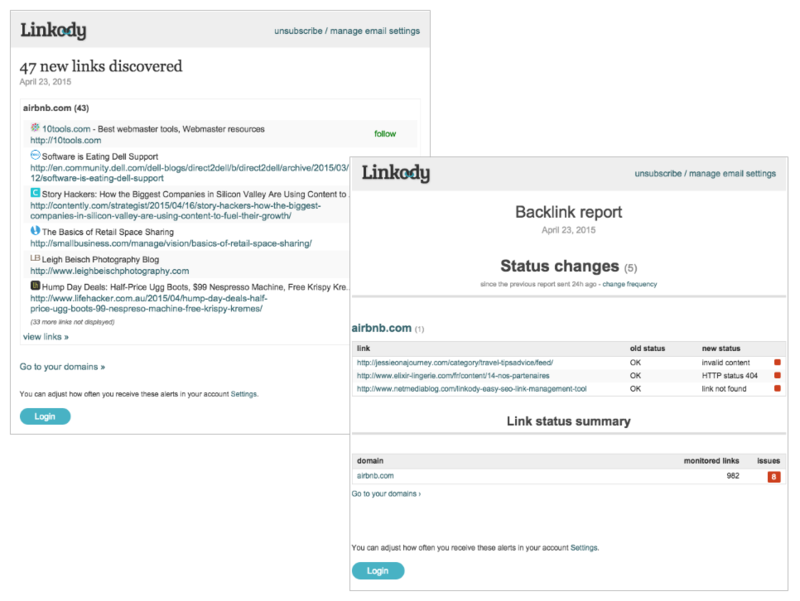 Linkody makes backlink monitoring a walk in the park. We will send you notifications when you gain new backlinks and when they are removed. Never check your backlinks manually again! Wait a second… are you not tracking your competitors' linkbuilding strategy yet? Let us help you: we will tell you exactly when your competitors are getting backlinks. Get valuable insight in their linkbuilding strategy but as well in their daily affairs. We will show you handy SEO metrics so you can easily assess which backlinks are valuable and which could potentially harm your website's keyword positions (and traffic!). When identified, use our disavow tool to remove bad backlinks. 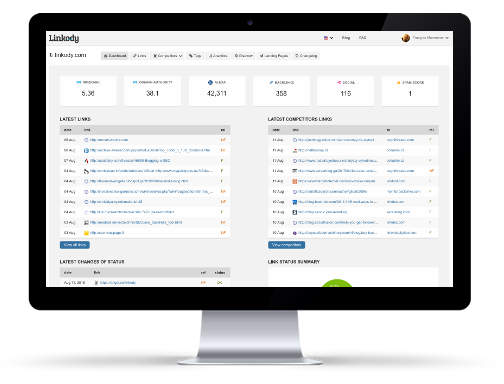 Linkody’s backlink monitoring tool enables its loyal customers to find, track, and analyze valuable backlinks 24/7. The company is located in Amsterdam, the Netherlands, and has been continuously exceeding the highest industry standards since 2011. Show how many backlinks you have. © 2019 linkody.com. All rights reserved.